A week or so before the Brexit referendum, I found myself at the National Museum in Warsaw, looking at Maurycy (sometimes Moses, sometimes Moritz) Gottlieb’s 1879 painting, Christ Preaching at Capernaum. Gottlieb was reportedly inspired to paint the scene after reading Heinrich Graetz’s multivolume History of the Jews, and, taking his cue from Graetz, Gottlieb painted a very Jewish Jesus—preaching in a synagogue, to a rapt Jewish audience (which includes Gottlieb himself). Gottlieb, Jews Praying in the Synagogue on Yom Kippur (1878), Tel Aviv Museum of Art. The painting is a profound intervention, pushing back against centuries of Christian art obsessed with portraying Jesus surrounded by Jewish tormentors: Jews as dogs, Jews as monsters, Jews as Christ-killers. 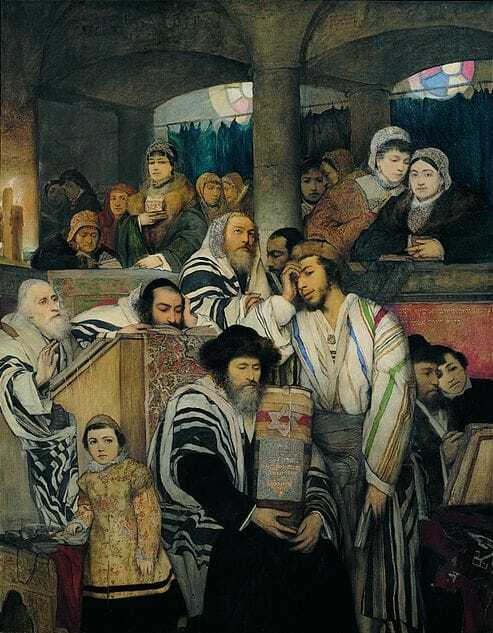 Considered together with another famous painting of Gottlieb’s, the 1878 Jews Praying in the Synagogue on Yom Kippur (now at the Tel Aviv Museum of Art), the painting also seems to be an attempt, by Gottlieb, to create a space where one could be both fully Jewish and fully Polish. After I returned to the UK (my adopted home), and in the immediate aftermath of the Brexit referendum, I found myself continuing to think about Gottlieb’s paintings. I was surprised they had stuck with me, as I tend to favor abstract and conceptual art rather than history paintings. As a historian, I was tickled by the idea of Gottlieb painting Christ Preaching at Capernaum in response to Graetz—how many artists paint pictures in response to multivolume histories these days? But more than that, I was moved by the fact that the paintings, both focused on prayer, seemed to suggest an idea of belonging that allows for difference. Although Gottlieb enjoys canonical status (he gets star treatment at POLIN, the Museum of the History of Polish Jews in Warsaw), I wasn’t particularly familiar with him and felt compelled to learn more. He was born in 1856 in Drohobycz in Galicia, then part of the Austro-Hungarian Empire (and now in Ukraine), and died at the age of 23 in 1879. There must have been something in the water in Drohobycz, because two other important Jewish artists, Ephraim Moses Lilien and Bruno Schulz, were also born there, not to mention Maurycy Gottlieb’s younger brother, Leopold Gottlieb, who also became a painter. The Austrian Galicia into which Gottlieb was born and which inspired his work was a multiethnic jumble and often got a bad rap: the writer Karl Emil Franzos, for one, famously called Galicia “Half-Asia.” Reading Ezra Mendelsohn’s monograph on Gottlieb, I came across a particularly telling quote about Galicia, which, right after Brexit, pulled me up short. Mendelsohn quotes Leopold von Sacher-Masoch, a native son of Galicia (and father of the eponymous “masochism”), who wrote that it was a “wild, odd, often grotesquely variegated world,” where “Poles, Ruthenians, Armenians, Romanians, Jews, Karaites and Russians all lived together. . . . It was a chaos of different ways of life, dress and religions” (6–7). Reading this quote, just days after the Brexit referendum, I was filled with sadness. To me, that Galician “chaos” sounds like paradise—but it seems that a lot of people in the UK today feel differently. For them, variety and difference are grotesque and chaotic. It is not my intention to (very belatedly) mourn the Austro-Hungarian Empire—though there are certainly worse people to keep company with than the likes of writer Joseph Roth, who elegized the Empire while drinking himself to death in ominous interwar Europe. And unquestionably there were ethnic tensions and conflicts in Austrian Galicia, but Gottlieb’s vision of a space where one could be both Jewish and Polish, where nation was not so narrowly defined, still resonates. Another well-known Galician, Leopold Weiss, who eventually converted to Islam and changed his name to Muhammad Asad, was born not so far away from Drohobycz, in Lviv in 1900. As a young man travelling in the Middle East, Asad identified the Bedouin he encountered as the true descendants of Abraham, and conceived of his conversion to Islam as an affirmation of his (Jewish) roots. “I am a Pole and a Jew, and I wish, God willing, to work for both” (qtd. in Mendelsohn 34). 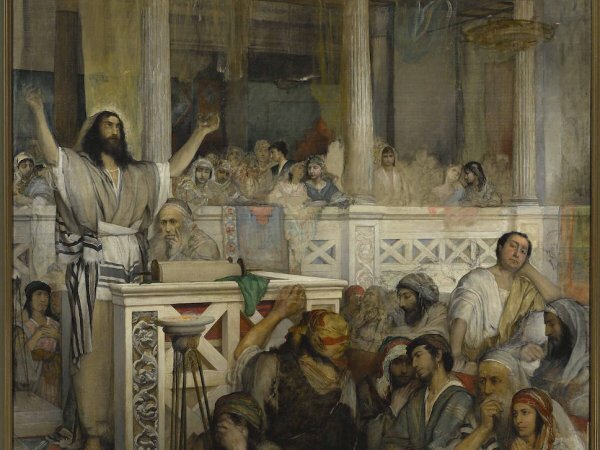 Christ Preaching at Capernaum and Jews Praying in the Synagogue on Yom Kippur are examples of him doing just that—working for both. The oriental robes worn by Jesus and his audience in Christ Preaching at Capernaum echo the prayer shawls that are a central compositional feature in Jews Praying in the Synagogue on Yom Kippur, and, looking at the pictures together, 2nd-Temple-period Palestine (and Christianity’s sacred history) and nineteenth-century Jewish Galicia become, in some way, the same place, suffused with the same messianic longing for a better world. In both paintings Gottlieb depicts people searching for redemption — reminding the viewer that the longing for a better, more just world, can unite rather than divide. It is a vision I want to hold on to, in spite of the Brexit vote, in spite of everything.